Cut CANDIQUIK block in half. Set ½ aside for later and melt ½ in microwave for 45 seconds. Stir and continue to melt in 15 second increments until melted, stirring between increments. Add peanut butter to melted CANDIQUIK and stir well. Mix in sugar cone crumbs and spread in the bottom of a springform pan. Refrigerate for 10 minutes to set. 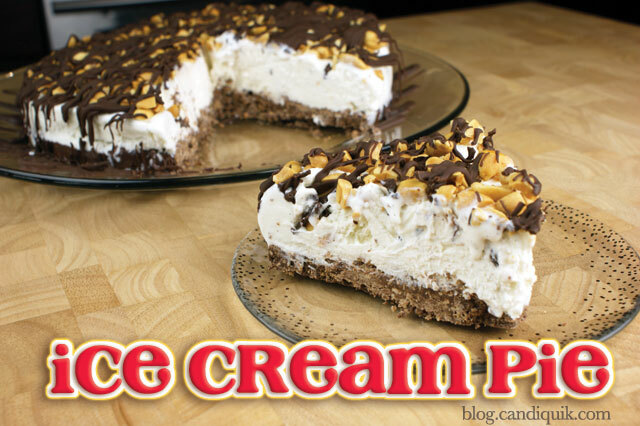 Spread softened ice cream over crust and smooth the top. Cover and place in freezer to allow ice cream to firm up until ready to serve, at least 1 hour. When ready to serve, remove sides of springform pan and sprinkle with peanuts. Melt remaining half block of CANDIQUIK as directed above and drizzle over the top and sides of pie.